Gazing through the broken glass of the drivers soor I saw no cup holders, no heated seats, no radio, no GPS, no power windows, no power door locks, no power anything. The springs in the seat were showing, the vinyl was shredded and steel dash was rusty, I had to have it. I couldn't remember ever seeing a truck with so much attitude. This was a veteran of WWII, and had experienced things that I only heard of. An amazing piece of history. Sweet, was my first thought when seeing the old Carryall for the first time. However, after seeing the condition of the old truck, I knew that this was going to be a long winter because of all the banging and grinding that my Dad would be doing on this truck. But first, Dad would need my help in just getting the old truck into his shop due to the X-treme winter conditions on the incline into the shop. allow the leather to warm up on a February morning. My son Dylan and I prepared to pull an empty car hauler to Keremeos, about 2.5 hours south of where we live in Vernon, BC, Canada. I couldn't help but think about the difference 66 years had make in the Dodge line of trucks in terms of creature comforts. As I sat on the nicely warmed leather of the passenger seat, I thought to myself how did I let myself get talked into getting up this early just to get a rusty old bucket of bolts. I guess the bribe of a pancake breakfast at the world famous Jammery make up for that. I am not sure if it was world famous, but it is now. That is where I ran into Mel Schiller, who, as it turns out, lives just an hour and half due south of me, in Penticton BC. Mel's passion for Power Wagons and Dodge military trucks was quite evident when I first talked with him on the phone. He struck me as a kind hearted and considerate person that was more than willing to help an amateur like myself with any spare parts or advice I might need. Mel is a seasoned mechanical expert on many of the older and newer Dodge trucks, although he would be the last person to mention it to anyone. Ohhh... Yes. The forum. Anytime anybody at home is looking for my Dad, you can find him either on the Power Wagon Advertiser forum or in his shop making far too much noise trying to straighten the sheet metal on one of his old trucks. Every time I have ever gone onto the forum, it was to show my Dad how to get certain features working, e.g. avatars and signatures. 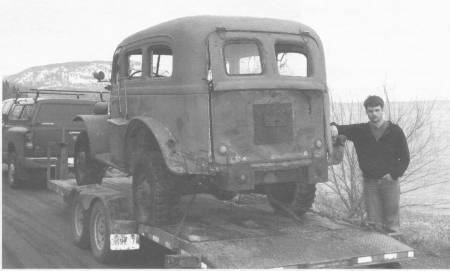 The Dodge WC26 started life with a build contract from the US armed forces back in 1941; the Army purchased the truck for military duty. 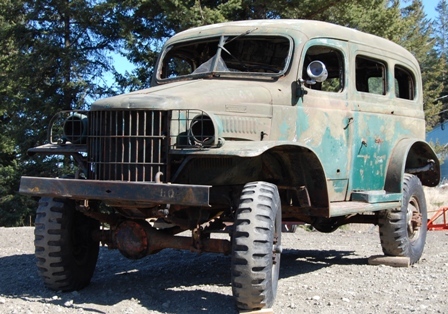 When they finished with it, the US army sold it to the California Forest Service for a few years of bouncing through muddy pot holes and climbing over stumps. When forestry finished with the truck, they sold it to a private citizen who used it to eventually move to BC, Canada in the early seventies. At that time he exchanged the engine for one with a longer block, and also mounted a plow to the front to keep the snow cleared from his drive. According to Mel, that is when he hit a stump and the cooling fan that was then too close to the radiator took a swipe at it and ruined it. After that little incident he decided to park the truck in the woods of his property till he got the chance to fix it. Thirty years later, the new owner of the said property responded to Mel's ad for Power Wagon part and asked if he was interested in the old wreck. Mel picked the truck up and stored it for the next few years. When I finally realized that Mel had a spare Carryall I could not resist bugging him until he sold it to me. My first impression of this truck was, Countach! or Holy Cow in Italian, As we drove closer, I realized that the real life stance of this WWII veteran seemed even more intimidating than a regular power wagon. The only time I had ever seen one of these trucks was in a WWII recreation game, or in the movies. As I backed the trailer up to the Carryall, I was thinking about how much work this could turn out to be. On the other hand I was very thankful that Dylan had agreed to come with me on this trip. I figured I would let my dad take the first shift on the come-along, after all, that would be about three cranks I would not have to do myself. I knew Dylan would last much longer on the hand and sweat powered winch than I would. Sure enough, the truck would not budge. I checked to see if the transmission was in gear and found the shifter was stuck in first. I pulled and pushed on the shifter until I thought it would break. I asked Dylan to give it a try. He got in and the shifter slid instantaneously into neutral. At that point he looked at me as if to say "You must be older than you first thought". I loosened it for him; it is Dad's job to install confidence in his son. I could tell my Dad was having a little bit of trouble with the gear shift so when he asked me to give it a try, I thought to myself what's the worst that could happen. As I climbed into the old beast I felt something very uncomfortable on the seat, looking down I realized that seats have come a long way since the 40's, they no longer have springs sticking though the vinyl. I grabbed the shifter knob and it moved; obviously it pays to be mechanically inclined, I tried to make my Dad feel better by not saying too much. After about an hour of playing around with the hand winch, we had the old girl loaded, tied down, and read for the highway trip home. We live on the side of a mountain with a fairly steep driveway that was still covered in snow. That means I would have to take a run at the driveway just to be able to crest the hill with out getting stuck. We made the top of the drive way but ended up getting stuck in the deep snow in front of the shop. That's when I decided to unhook the trailer and pull the Carryall off first before trying to park the trailer. I asked Dylan to steer the Carryall while I pulled it with my 3500. I was feeling a little nervous knowing that my dad was going to floor his diesel to obtain the required momentum before the tow strap tightened o the Carryall, for the small stretch of hill that remained. After the first jolt I found myself and the Carryall off of the trailer. After about 10 to 15 more tries we finally got it out of the snow and parked the old truck out of the way. Our immediate plans are to get the engine running, do the brakes, the glass and the gauges before driving it and showing if off at a few local car shows. Some time down the road we will do a frame up restoration, I will be sure to keep you posted on the results. Jake Wiebe & Dylan Wiebe.